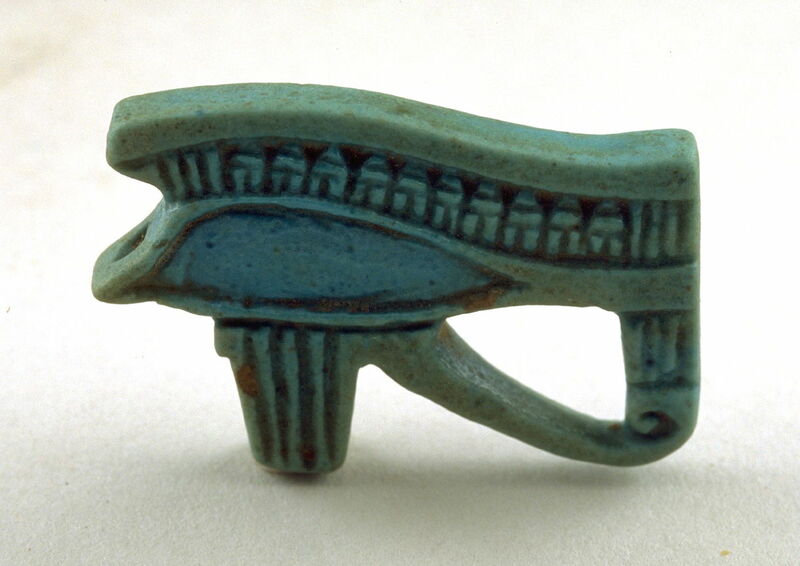 One of the most recognizable forms of ancient Egyptian art is the udjat (also spelled wedjat and utchat), an amulet representing the eye of the Sky God Horus. The udjat amulet is also one types of art or artifact from ancient Egypt that has survived in fairly large numbers, making it easily accessible on the legitimate antiquities market today. The udjat seems to have made its appearance during the later part of the Old Kingdom, around 2,300 BC, and continued into the Roman period, disappearing around 200 AD due to changes in belief systems. It was made in every material imaginable, including gold, electrum, silver, semi-precious and other hard stones, wood, pottery, faience and glazed composition, these last two materials being the most common. Most surviving examples are small, simple monochrome or polychrome glazed composition but the range of decorative styles and techniques, as well as sizes, was tremendous. In this brief photo essay we will look at images of some well documented examples, from Clio Ancient Art and museum collections. The example shown above, sold by Clio Ancient Art in 2013 to a US collector and formerly in an old UK private collection, offers a clear picture of the elements of the udjat. Each element of this seemingly simple design — the right side, the pupil, the eyebrow, the left side, the curved tail and the teardrop — is actually part of a complex Egyptian mythology, each represented by all or part of a hieroglyphic symbol. The term “udjat” can be translated as “whole one”, a reference to the primal conflict between the Sky God Horus and his evil rival Set, in which Horus lost his eye in battle. Thoth (depending on the version of the story over time, also Isis or Hathor) magically restored the eye, thus restoring order and “maat” — the fundamental force of order and good in the Egyptian world view. Because Horus’ right eye was said to represent the Sun and his left eye the Moon, the loss and restoration of his eye was equated with the darkening and lightening of the Moon during its phases. 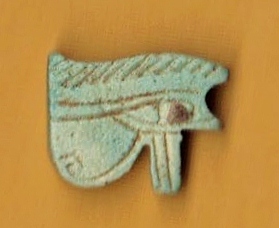 And because the eye’s restoration was so important in Egyptian mythology, with many variations over time and regionally, the udjat took on a powerful protective characteristic, making it an especially efficacious personal and funerary amulet. So, this simple design offers much muore than meets the eye! The example above is an openwork type of the Third Intermediate or Late Period, 1,069 – 332 BC, in glazed composition (self glazing material, similar to pure faience but with a more complex internal structure). Above is a rather large polychrome example in blue green and black faience, dating to the Late Period, 712-332 BC. Most specimens more closely resemble the small, simple example shown above in polychrome faience. All of these, including the openwork example, have been pierced lengthwise to allow for suspension on a string or as one element of many in a more complex piece of jewelery. 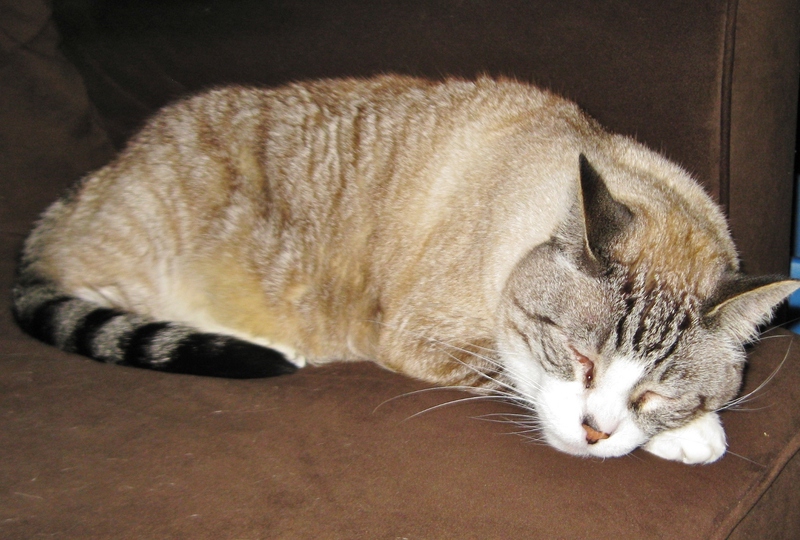 Of course, we cannot overlook the fine example below of the Eye of Horus, featured on Mickey the Cat, who inhabits the Clio Ancient Art offices here in Wilmington, NC. fascinating. Last year I did a series on the Legend of the Eye. Its nice to revisit this powerful Egyptian symbol.